Don't you love free beadwork patterns? Who doesn't - especially when they are organized based on the stitch type and created by some of the top names in beadwork! In this case, you will have to make a trade though. Downloading them will require that you provide your email address to sign up for the beading daily newsletter. But you may find you like the newsletter too! And if you don't, you can un-subscribe, and you can still keep all these free patterns that you've already downloaded. The Brick stitch is great for new beaders. The basic flat brick stitch is easy to learn, learning to increase and decrease brick stitch is straight forward and logical, and there are other variations such as circular brick stitch. In this download, you'll get five free brick stitch project instructions. The projects include a beginner necklace with diamond shapes, a free form style brick stitch bracelet, sunburst earrings that use brick stitch combined with other stitches, a wide cuff bracelet, and a choker with beaded flower shapes. If the brick stitch isn't the first stitch that you learn, then your first will probably be peyote. The peyote stitch is another great stitch for beginners. And again, there are lots of variations to learn, so you won't get bored quickly. Most people start with flat even count peyote, then get the courage up to try flat odd-count peyote, which is a little more difficult because it has a tricky turn at the end of every other row. From there, you can work your way to flat circular peyote, tubular even count peyote, tubular odd count peyote, free form peyote, and there's probably more. So much fun! This free peyote project e-book download is a great place to start learning. You can practice with seven peyote projects at various skill levels. Learn to make simple peyote band rings, tubular peyote rope, cicular peyote mosaic necklace, peyote clasp, flat peyote stitch shapes, plus a couple of more advanced peyote projects. Bead embroidery is a little different than most off loom beadweaving stitches because the beads are stitched to a type of bead embroidery foundation. There are several basic bead embroidery stitches, with backstitch being the most commonly used, but the results can be anything but basic. Whether you already know how to do bead embroidery or are looking to learn, these five bead embroidery patterns are sure to inspire you and give you new projects to practice on. Learn how to make a bead embroidered pin, bead embroidered letters, embellish a pouch with beadwork, and a bead embroidery bracelet or cuff. Whether you are new to bead looming or have been doing it for a while, you may find some new ideas in this download of four bead loom bracelet patterns. You'll find tapestry, chevron and open work designs. This download will expand your view of beaded ropes. Featuring projects using African Helix, tubular herringbone stitch, twisted tubular herringbone rope, and two different spiral rope stitch projects, these projects use unusual bead combinations and patterns to push beaded ropes from basic to wow. Learn about the history of Native American beadwork, including the tools and materials that are essential to making Native American style beadwork. Then learn how to make a tubular peyote necklace, loom bracelet, or pendant and earrings. The Chevron stitch is a variation of netting that is quickly becoming popular since it is easy to learn and stitches up fast. It can also be used as a base for fringe and other embellishment. Explore the options for Chevron stitch with these 4 free beading patterns for two necklaces, a lariat and a bracelet. Bead crochet is a great crossover craft that combines the basics of crochet with the addition of glass and crystal beads. You'll find four projects that make a pin, lariat, bracelet and amulet bag that will allow you to explore the options this combination craft provides. ​Making beads with beads - what a great concept. And who knew there were so many options! Most of these projects use a form of peyote stitch, such as tubular peyote, but they include beaded forms covering bead frames as well as hollow forms that can be stuffed with herbs or scents. 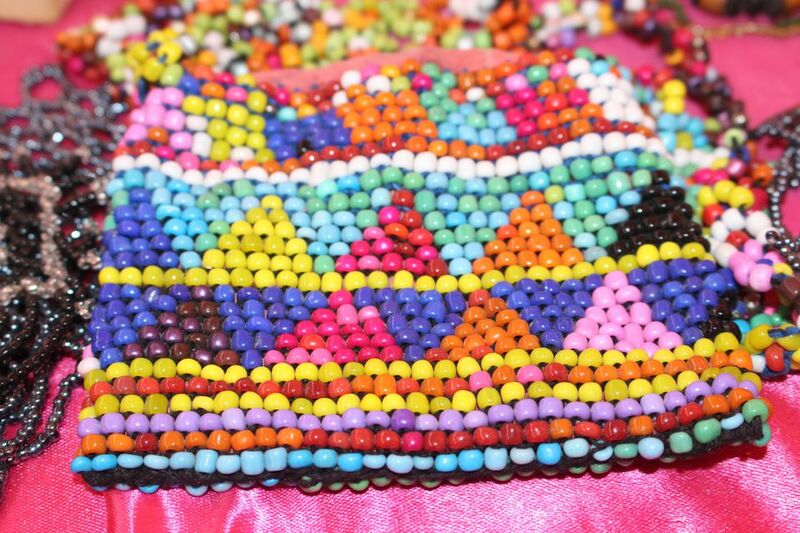 There is even one project that makes beaded beads in as little as ten minutes each! These 5 free bead netting projects give you an idea of the variation that can be achieved with the versatile netting stitch. The nice thing about these projects is that they rely on seed beads as well as larger beads and crystals to explore open weave necklaces, amulet bag and richly textured bracelets. And who doesn't love sparkly jewelry? These crystal bead projects use a variety of stitches and techniques, but all have one thing in common - SPARKLE!